When is a minifig not a minifig any more where LEGO is concerned? When it is larger than what it is supposed to be? We leave the philosophers to argue about that, but for the moment, we’re pleased as punch to bring you the LEGO City Torches which are available for pre-order at £14.99 a pop, bringing an alternative touch to your home decoration without breaking the bank. Available in policeman, fireman and construction worker flavors, these torches are extremely original, standing tall at 19cm while being able to light up your world as they put their best foot forward – after all, the torch itself is built into the bottom left leg of each minifig. 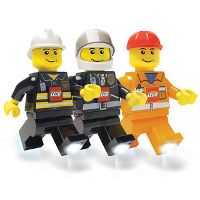 It is also interesting to note that each of the professions that the minifig comes in will need a torch sooner or later in the line of their work, now how about it? To activate the LED light at the bottom, all you need to do is press the logo on their chest and you’re good to go – as long as there are batteries left inside, of course.